The Star says KC “dodged a bullet” when it didn’t get the Republican National Convention: Are you kidding me? Yael Abouhalkah, one of two remaining editorial page writers left at The Star, said in today’s editorial that it could turn out “fortune smiled on Kansas City two years ago,” when the Republicans chose Cleveland instead of Kansas City for this year’s G.O.P. convention. I say: Are you nuts, Yael? This is shaping up to be the most exciting and interesting national convention since the Republicans met here in 1976 and Ronald Reagan and Gerald Ford battled to the wire. Every convention since then, on both the Democratic and Republican sides, has been about as interesting as watching a University of Connecticut women’s basketball game, with the outcome preordained long beforehand. I was on The Kansas City Times then, and between The Times and The Star we probably had two dozen reporters on the convention, held at Kemper Arena, and related events. I didn’t get in on much of the prime-time coverage, but I was thrilled just to be on the periphery. At the time, I’d only been at The Star seven years, and my full-time beat was the Jackson County Courthouse, where I covered both politics and the courts. …It amazes me that Abouhalkah would wave off this potentially great story, which will give Cleveland a huge economic boost and rock the town in a bigger way than The Temptations could have in their prime. Of course, the 1968 Democratic convention was a disaster. But big-city police departments have come a long way since then in their human relations and crowd-control methods. Yael cited Trump’s March 12 appearance here, where police pepper-sprayed some protesters, and a few people got roughed up (not sure it was by the cops), and a few got arrested. So what? Despite the concerted efforts of some who sought to blow that up into an excessive-force scandal, the incident didn’t trigger any outrage, and the story was dead in a couple of days. From all indications, KCPD handled the situation well, and I’ve got full confidence that Chief Darryl Forte, his top deputies and the uniformed officers would preside with wisdom and restraint — and, most important, would maintain order on the streets — at a national political convention. Some of you might remember that originally, back when KC was being considered for the convention, I wrote I didn’t want it here, mainly because of the inconvenience it would have posed to residents, particularly in getting into and out of downtown. After reflecting on the scale of the event and the P.R. it would generate for our city, I quickly backpedaled and said of course we should want the Republicans to come here. Now, in light of the way this Republican battle is going, I’m terribly disappointed the Republicans won’t be descending on Sprint Center July 18 to 21. Probably the biggest story we’ll have in KC that week is the Royals playing the Indians…Yes, the Cleveland Indians! Hell, even the Indians’ players are probably going to be sick they’re out of town, missing what is sure to be one of the biggest national stories of the year. Oh, well…Play ball, and, singers, please give us nice renditions of the National Anthem at The K.
I had a sad and nostalgic turn today, when I saw in the paper that an old horse-race fan — a guy I used to see at Omaha’s Ak-Sar-Ben racetrack back in the ’80s — had died. 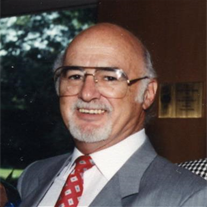 Herbert “Herbie” Mendelsohn, longtime owner of Sunshine Lighting Co., died April 4. I got to know Herbie while I was on the features page in the late ’70s and early ’80s. I heard he was a good handicapper and decided to write a story about him. Like him, I regularly made the three-and-a-half-hour run up I-29 to Omaha for the Saturday races. The stands would be filled, and full fields of horses made for exciting wagering. Sometimes the Zipper would get up in time, and sometimes he’d fall short. But he always gave the fans a thrill and a reason to return. Those were great times at Ak…And Herbie Mendelsohn was one great character. He also liked to bowl, play cards and golf, and he was a Royals’ season ticket holder since the team’s inception. Herbie was 88 and lived in Overland Park. Great story on Herbie Mendelsohn, Jim. Did you know him, Laura? That’s a great way to become a great handicapper, have people who don’t remember how often your picks win! He spoke authoritatively, like he knew for sure who was going to win. But, you know, it’s racing, and nobody knows — sometimes even when a race is fixed. I remember the name, Will, but I’m not a regular reader of the Pitch. But don’t tell Vockrodt or Hudnall! I have to side with Yael on this, Fitz. There’s not enough Lysol and fumigants in the world to clean this city of the stench that will be left behind by the GOP leadership, their power brokers and the Trump and Cruz supporters. You loooovvvee to bait, don’t you? What makes you so clean and perfect? You lost me when you said you have to side with Yael. I see you’re at it again. That spelling (including lc) was done on purpose. See why you shouldn’t edit? Fitz, I think Skip Sleyster would have campaigned for Kansas City to reel in that convention, don’t you? Just of think of all the extra business it would generate for Super Flea!